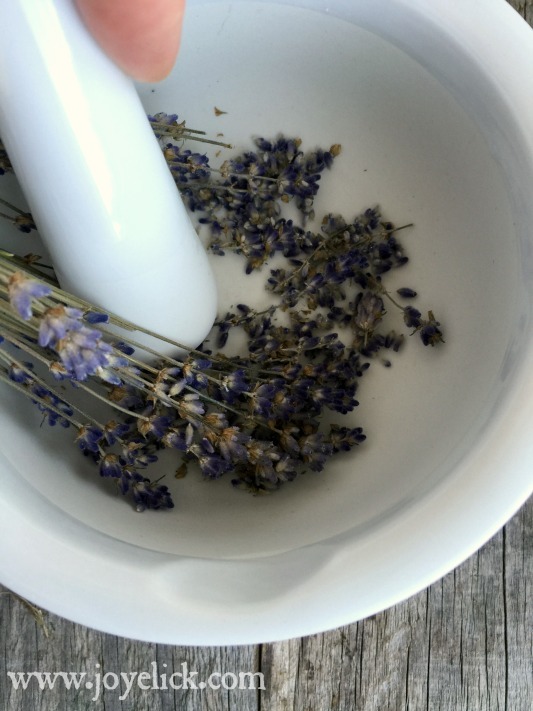 DIY stress-relieving FOOT SOAK and DETOX: Relieve stress and ditch toxins with this soothing lavender-lemon recipe. 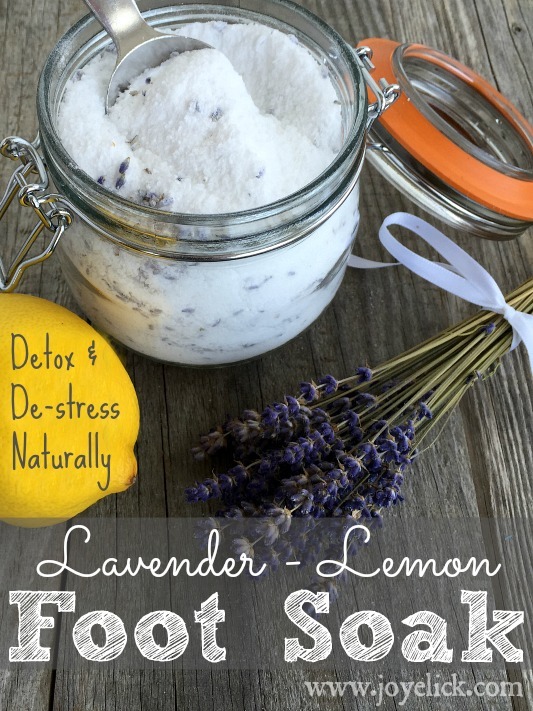 I've talked about the wonders of an epsom salt fizzy bath, but today, lets talk about taking just our feet for a dip in a soothing lavender-lemon foot soak. This made-from-scratch life keeps me on my toes, but beyond that for some odd reason, I seem to have an aversion to sitting too long these days. (OK maybe it has something to do with having had back surgery a few months ago, and now sitting for long periods is a thing of the past). So I mix it up. I sit. I stand. I stand a lot. In the kitchen. In the office. I stand to drive...no, that's not possible is it? Well, the point is, I stand a lot. I even stand often to do my laptop work, which is what usually does me in. So my friend, you can see why my dogs are tired by the end of the day. Sore feet drain my energy away and make me, um--whiny. So to spare my dear husband from listening to me moan, I'll turn to a glass of iced black cherry tea (my fave right now!) and dip my big toes into a soothing lavender-lemon soak for a few. Foot soaks are mini pamper-me-spa moments that can easily fit into even the busiest schedule. And man do they work to relieve stress and tension! By simply soaking my feet, my back and shoulders will relax too. It's not just the warm water that does the magic. 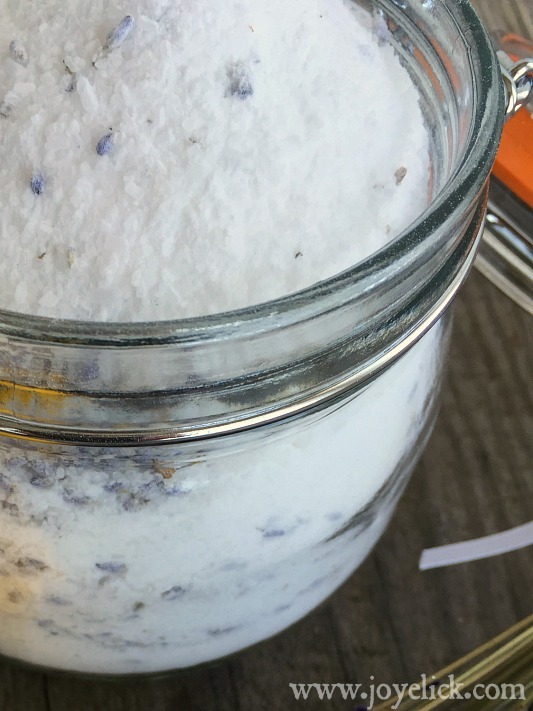 This foot soak recipe uses epsom salt and essential oils, which work wonders on the body. Not only do they work together to draw out aches and pains, they also work to draw out toxins. Have you heard the buzz on detoxing? It's no secret we're swimming in an ocean of toxins these days. Ways to rid our bodies of these nasties is a pretty hot topic. Apparently, detoxing through the skin (which is what happens with an epsom salt foot soak) is a really safe way to go about flushing toxins from the body (as opposed to using the digestive system, which is less efficient). Epsom salt is powerful stuff for drawing toxins from the body. Did you know epsom salt is not actually salt? It's a mineral compound of magnesium and sulfate. There's two sides to this mystery-working substance. Not only does it kind of "magnetically" draw out the yucky stuff; it puts good stuff into us. Our bodies need magnesium and apparently most Americans are deficient (according to this article anyway). Since we seem to absorb this useful element best through our skin, dunking our feet for a while in a hot epsom salt solution may accomplish more than you may have thought! Essential oils are essential. 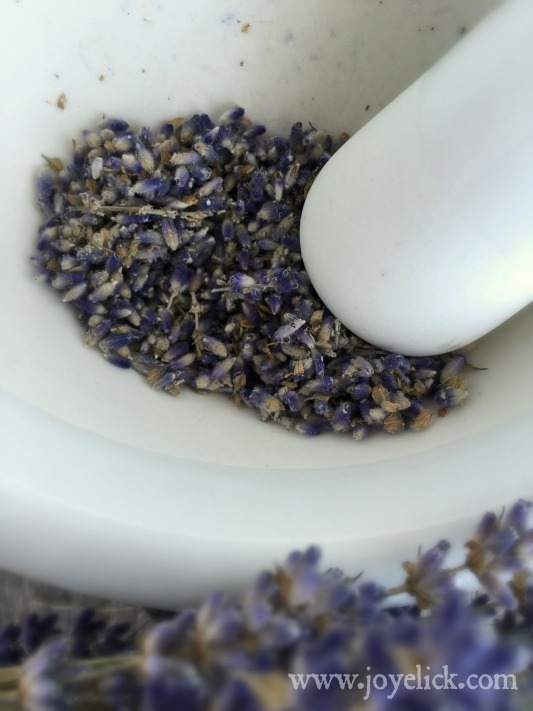 This foot soak just wouldn't be the same without the awesome therapeutic effects of lavender and lemon essential oils (that is, when you use pure therapeutic grade oils, anyway). Adding essential oils to a foot soak is a powerful way to benefit your whole body. It's a well known fact that essential oils are easily absorbed through the feet. That's because your feet have larger pores. And the neat thing about putting essential oils on your feet, is that you can effect specific parts of your body from that one location. That's because there's all these reflex points in your feet, pathways that can target specific areas of concern in your body with the beneficial effects of any given oil. 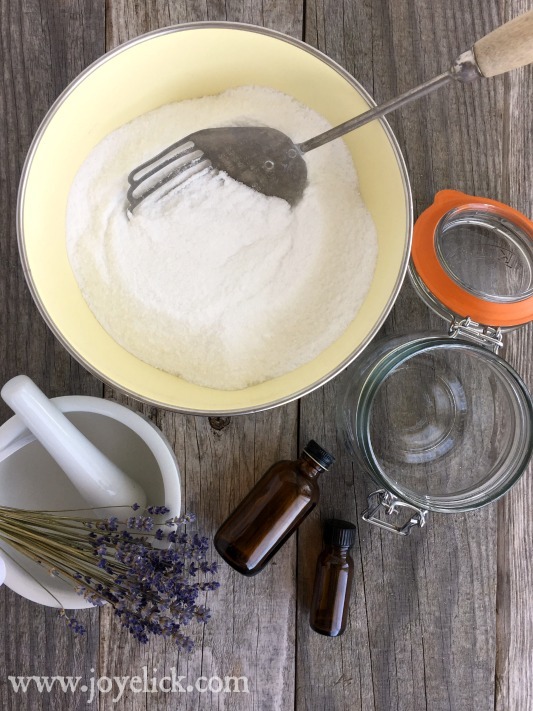 Lavender essential oil is well known for its soothing, tension-relieving properties, while lemon essential oil is known for its cleansing, purifying properties. By placing these oils in your foot soak, you can enjoy the relaxing, pain-relieving effects of lavender, and the detoxifying benefits of lemon, not just in your feet, but throughout your whole body. So now let's have a looksie at how easy it is to make this amazing foot soak, shall we? Combine all the dry ingredients in a bowl and mix well. You can use a whisk or a slotted spoon, but what you're after is a way to kind of sift and mix everything together evenly. Once everything is mixed, add the drops of essential oil and stir them in. Adding dried lavender is totally optional, but I like it because it makes this foot soak look organic and natural (which of course it would be without the lavender, too, but you get what I mean). It can add a nice touch if your giving this as a gift, too. 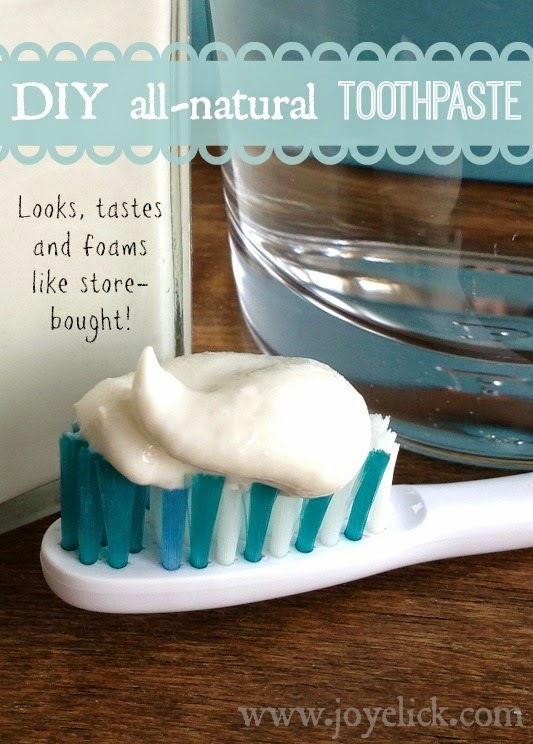 Store your foot soak powder in an 17.5 ounce (or pint-size) air-tight container. 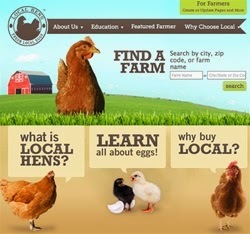 I like the jar pictured and linked to because it's convenient with a lid that's attached. (I keep these around for bath and body stuff, because I have a way of dropping separate lids and rings all over the place, especially in the shower, but then this foot soak isn't used in the shower, so really any air-tight container would work just fine). To use, simply fill a basin with hottish-warm water, enough to cover to your ankles. 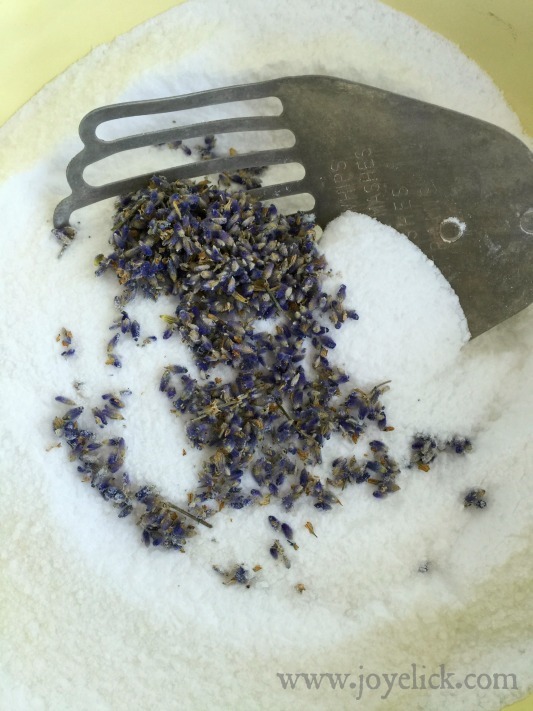 Sprinkle in a 1/2 cup of your homemade foot soak powder, stirring to dissolve. Then take your feet for a relaxing dip for about 15 minutes. Don't forget to breath and enjoy the fresh relaxing scents while you sit. You'll be amazed at how the stress and tension melt away! Well, that's a wrap, folks. Does the baking soda react with the liquid EO? I've read about problems with jars cracking under the pressure created by the gas build up if there's moisture in the recipe. I'm kinda new to this and wasn't sure if that's something to worry about....thanks! Hi there! No there shouldn't be any kind of gas buildup or reaction. Thanks for asking. Whether by drinking it, sweating or bathing in it, water has been used to expel toxins, and restore health since the dawn of humanity. 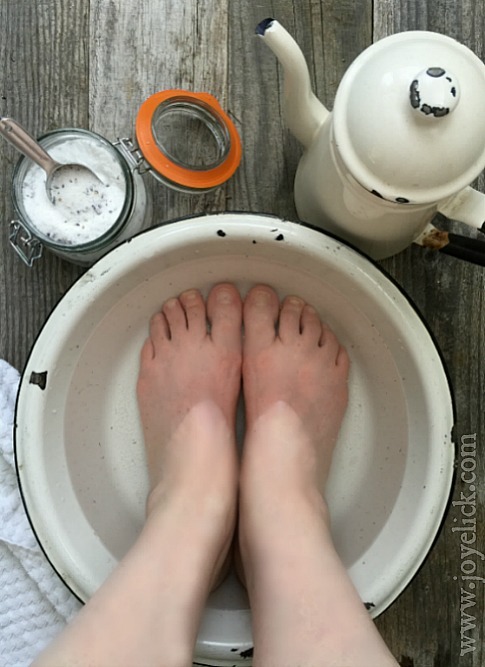 It is to make this amazing foot soak, thanks for sharing! I will definitely need this stress relieving foot soak after difficult working days. This is a very nice post. I liked it very much. Thanks for sharing it. As we know detoxing is very important for our body without detoxing you can not remove unwanted substances from our body. You can find more detoxes here.